For many RV owners getting an Extended Warranty is a hard decision to make. Do you pay a monthly premium for coverage you are not sure you will need or just put some money away each month and hope you are able to fix any problems yourself. If you go with a higher deductible you can lower your monthly cost. Put the deductible in an account ready for a time you need it and save monthly. As your RV gets older year by year, extended warranty coverage goes up so it is beneficial to get one when your RV is still in its prime. When it comes to Extended Warranties going with the big dog has its benefits. With a large customer base service companies tend to treat customers better when they are represented by a large company. Research is key though, check up on the company and see how it stacks up with its customers. Good Sam has a good rating and is one of the biggest in the USA, and can also offer other services like roadside assistance, which may be exactly what you need when your RV breaks down. The first step is to get a quote and see what pricing looks like for your year and model of RV and how the deductible effects monthly pricing. None of us want to call in to get a quote and then the sales pitch, so here is a link where you can obtain a no obligation quote fast and with very minimal information. You need to fill in your email address but they do not hound you after you get your quote. When you receive your quote you will also receive the Extended Service Plan Terms and Conditions which is very beneficial as you can see exactly what is covered and how the warranty works before you do anything. In most cases the Terms and Conditions is the last document you see, when it should be the first item to look over to make sure you are getting good coverage. So what does the cost of an Extended Warranty look like for your year and make of RV and how did the deductible effect the monthly price? By enrolling in an Extended Service Plan before your manufacturer warranty expires, you are protected from any lapse of coverage when the warranty expires, and the warranties of your RV's individual components are covered as they each expire. Below are items the Extended Service Plan covers. Most of these items can be expensive to replace or repair and it gives peace of mind to know they are covered. 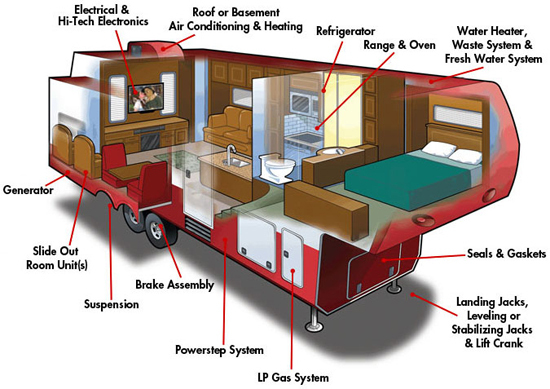 From our experience some of the finicky items in an RV that like to go the fritz is of course the heating unit when the temperature suddenly drops down to freezing. Refrigerators are well built nowadays but when they break it gets very costly to repair them of replace them. Thats is not a bill you want to have to deal with. To qualify for Good Sam Extended Service Plan coverage, your 5th wheel or travel trailer can be up to 15 years old. For new rigs, Good Sam Extended Service Plan protects RVs with a purchase price up to $750,000. For used vehicles, their plan protects RVs with a current value of up to $300,000. An Extended Service Plan is renewable on an annual basis until the RV is 18 years old. A tip on getting an Extended Warranty is not to wait to long. The older your RV is the more expensive the coverage can become. If you get your warranty early then as your RV ages the pricing for the warranty stays constant. When you do buy an Extended Warranty make sure the company you get the warranty from is going to provide you with excellent service and is good about paying the claims. You can get a cheap warranty and then struggle when you make a claim. Going with a large reputable company saves tons of headaches down the road. Extended warranties are big money makers for dealers so try to not get an extended warranty from a dealer as it is cheaper to deal with the company that offers the warranty. Get a copy of the contract before you sign anything and check exactly what coverage you are getting. Make sure you understand what items are NOT covered. Much confusion arises from owners not understanding what is covered and what is not. Then they try and make a claim only to find the item is not covered. Understanding from the outset will ensure you are happy with the coverage and are not going to get any surprises later on. Try not to make claims to soon after getting your extended warranty. Any claims soon after the extended warranty is purchased will cause a much higher level of inspection to make sure that it was not a pre-existing condition. Once you have a quote and know what it may cost you, you can relax and think about if it is worth it or not. Weigh up some alternatives and then make a decison when you feel comfortable.